LEXINGTON, Ky. – Immanuel Quickley made two free throws with one second left to secure a 70-66 victory for the fourth-ranked Kentucky Wildcats over Arkansas Tuesday night at Rupp Arena. The Razorbacks were down one, 66-65, with 12 seconds left after a Mason Jones 3-pointer. Tyler Herro, who scored a game-high 29 points, was fouled and made two free throws to give Kentucky a three-point lead. The Wildcats chose to foul Jalen Harris in the back-court to keep the Razorbacks from attempting a game-tying 3-pointer. Harris made the first free throw and intentionally miss the second. A violation on the second attempt gave Kentucky the ball. Arkansas defended Kentucky’s inbound play twice, but Kentucky eventually got the ball in to Quickley, who sealed the win. The Razorbacks played a near-perfect first half, committing just one turnover with 10 assists, that led 39-28 Arkansas lead at the break. Desi Sills hit two 3-pointers to start the second half and Arkansas would build its lead to as many as 15, 45-30. Isaiah Joe also made a big 3-pointer as the shot clock expired to give Arkansas a 12-point cushion with 14:40 left. Kentucky answered with an 18-3 run to take a 3-point lead, 54-51, with 7:07 left and never relinquished the lead although Arkansas kept it at least a two-possession game the rest of the contest. Joe led the Razorbacks with 19 points, making 5-of-7 from 3-point range. Sills tied his career high with 15 points, making 3-of-5 from long range and 4-of-4 from the line. Daniel Gafford finished with 14 points and eight rebounds, including 12 points and seven rebounds in the second half. Arkansas returns home to host Ole Miss on Saturday (Mar. 2). The athletics department will honor the 1994 NCAA Championship team during the weekend, including a ceremony during the game. Tip-off is set for Noon at Bud Walton Arena. Isaiah Joe hit three early 3-pointers, giving him 96 for his career, moving into fourth on the school’s all-time list. He passes Janero Pargo, who made 95 in 2002. Thanks to Joe, who also had a steal and ally-oop pass to Reggie Chaney for a dunk, Arkansas went on a 7-0 run, led 15-11 at 11:53 to force a Kentucky timeout. Overall, Arkansas went on a 12-1 run for a 20-12 lead and led 20-15 at the 8-minute media timeout. The Razorbacks pushed their lead to 11, 32-21, after two free throws by Joe and a Daniel Gafford dunk at 3:17. Gabe Osabuohien took a charge at 1:44, giving him 21 for the year. Daniel Gafford hit a layup with six seconds left to provide the 39-28 lead at the break. Isaiah Joe led the Razorbacks with 16 points. Desi Sills added seven. Desi Sills hit a pair of 3-pointers to start the second half for a 15-point lead (45-30 at 18:22). Isaiah Joe hit a deep 3-pointer as the shot clock expired (at 14:40) to give him 98 for the season, tying Pat Bradley for third on the school’s single-season list. Bradley hit 98 in 1997. Kentucky had an 18-3 run, including a 12-0 spurt, to take a 54-51 lead at 7:07. The run ended on a Daniel Gafford dunk. The Razorbacks went 13:04 to 6:20 without scoring. With two free throws at 4:10, Desi Sills scored his 14th and 15th points, tying a career high. Daniel Gafford battled on the offensive glass to tip in a lay-up with 58.6 seconds left to make it a 3-point game, 65-62. Mason Jones hit a 3-pointer with nine ticks left to make it a one-point game, 66-65. Arkansas’ starters were Desi Sills (G) – Isaiah Joe (G) – Jalen Harris (G) – Daniel Gafford (F) – Gabe Osabuohien (F). It is the second straight game for this lineup. Kentucky controlled the tip. Kentucky’s E.J. Montgomery scored the first points, a jumper at the elbow at 19:25. Isaiah Joe scored the first points for Arkansas, a 3-pointer at 17:49. Isaiah Joe made five 3-pointers to give him 98 for the season. Joe has already set the school record for 3’s made in a season by a freshman (breaking the previous mark of 83. With 98 3’s made, Joe now ranks third on the school’s single-season list with Pat Bradley, who made 98 in 2002. Rotnei Clarke made 100 3’s in 2010 and Scotty Thurman owns the school record with 102 3-pointers during the 1995 season. With four guaranteed games left this season (3 regular season and 1 SEC tournament game), Joe is on pace to make 112 3-pointers this season. That would be one shy of the SEC freshman record, currently held by Kentucky’s Jamal Murray (2015-16). If Joe were to finish with at 112 3-pointers, it would rank sixth-best in NCAA for trey made in a season by a freshman. 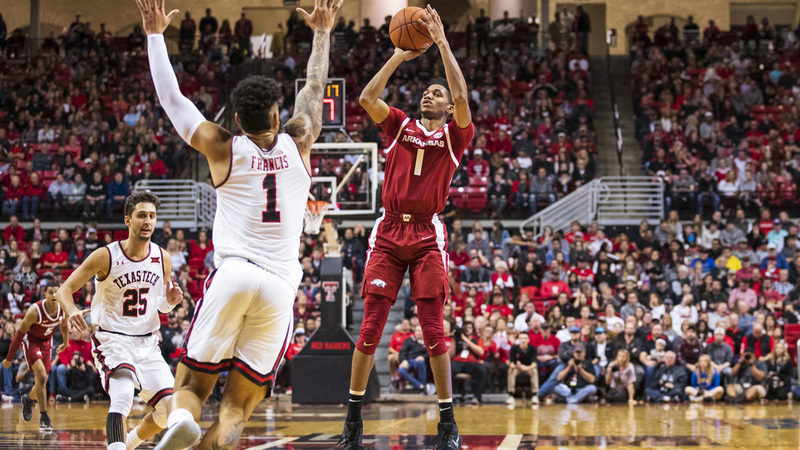 Gabe Osabuohien did not score, but, as usual, found other ways to be a positive force for the Razorbacks. The sophomore, who earned his second career start, had five rebounds, four assists, a blocked shot and took his 21st charge of the season. For the seventh time in the last nine games, Arkansas committed 15 or less turnovers, finishing with seven (one in the first half. Arkansas has committed single-digit turnovers five times this season. Arkansas is third in the SEC in turnover margin (+3.0) and second in the league in assist-to-turnover ratio (1.2). Daniel Gafford continues to lead the SEC in field goal percentage (.655), rebounding (8.9) and offensive rebounds (3.0). He is the only player in the SEC to rank among the top five – much less the top 10 – in scoring (5th, 16.5), rebounding (1st, 8.9), blocked shots (4th, 2.0), field goal percentage (1st, .655), offensive rebounds (1st, 3.0) and defensive rebounds (2nd, 5.9). Jalen Harris, who had three assists and one turnover, remains the SEC leader in assist-to-turnover ration (3.0). This was his 13th game this season to have one turnover or less.